The world of Swiss Army knives is vast, and I couldn’t hope to adequately cover the topic in the small amount of space I have here. Further, I am not in any way, shape, or form, an expert in the field. I am an enthusiastic Swiss Army knife owner however. I’ve had quite a number of them over the years. I bet that you’ve owned more than a few yourself. I’ve noticed that somehow, SAKs have a way of just ending up in your possession, regardless of whether or not you’ve actually tried to seek them out. When I decided to write about Swiss Army knives, I ransacked the house to try to gather up as many as I could find. Then, while refreshing my knowledge about them, I decided that I needed to get at least one new one, just to be up to date, you know . 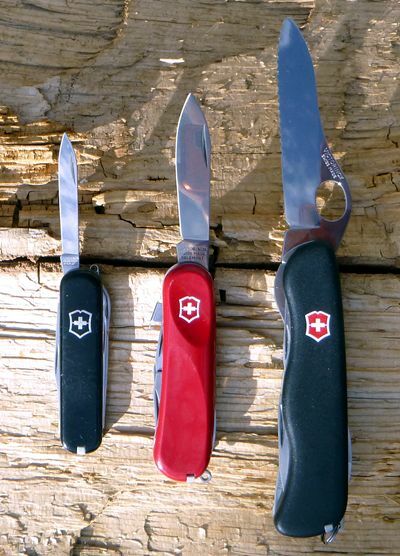 The number of different types of Swiss Army knives is vast, so to try to organize this a little bit, I’m going to break up the discussion into sizes small, medium, and large. And I’m only going to talk about the knives that I have. There are so many out there that I’ve never put my hands on. But first let’s talk about Victorinox, the only company now making real Swiss Army knives. 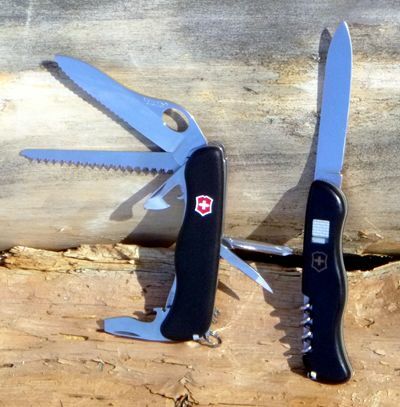 Sure, there are other companies making Swiss army-type knives, but Victorinox is the only company legally entitled to use the name Swiss Army knife. You may ask, “But what about Wenger?” That’s right, Wenger used to be the only other company supplying knives to the Swiss Army. They were also legally entitled to use the term Swiss Army knife. Wenger was purchased by Victorinox in 2005. The Wenger name lives on as a brand of Victorinox, but since 2013, all Wenger SAKs are now branded as Victorinox. 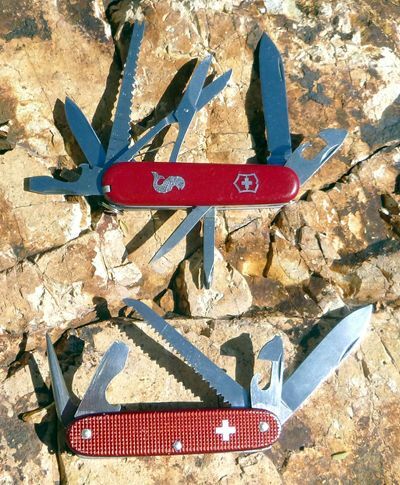 The former Wenger Swiss Army knives are now known as the Victorinox Delémont Collection. Delémont is the French Swiss city where the Wenger headquarters is located. There have been some small changes to the Wenger knives since Victorinox took them over, and some models have been dropped. In 1884, Karl Elsener started his cutlery business in Ibach Switzerland. Soon after he approached the Swiss government about supplying the Swiss army with knives manufactured in Switzerland, rather than importing them from Germany. In 1891 Elsener's Cutlery as a member of an association of Swiss cutlers, started supplying knives for the Swiss army. In 1909, in part to distinguish his knives from competition, Elsener started putting the Swiss Cross on all his knives. It was also in this year that Elsener named his company Victoria after his mother, who had just passed away. Twelve years later, after Stainless Steel is invented, Elsener added the suffix inox, from the French word inoxydable (meaning stainless) to the name and renamed the company Victorinox. Stainless steel was a significant historical achievement, and was also noted for many years on the tang-stamp of the main blade with the German word rostfrei. There have been four basic multipurpose folding knife designs that have been official Swiss Army soldier knives, issued to Swiss troops. The original was issued in 1891 and lasted to 1951. The 1951 redesign was the shortest-lived version, lasting only to 1960. In 1961 a new design was issued that featured waffle-pattern aluminum scales. That one lasted up to the year 2008, when the current Soldier knife was introduced. I have one SAK that is very similar to the 1961 Soldier knife, and another which is like the current Soldier knife. Both I own are commercial versions, and I’ll talk more about them when we get there. So now let’s get on to the knives. The Executive is a totally different story. Long before the term EDC (every day carry) became a fashionable term of art, I have referred to this as my “every day knife”. I was never hip enough to shorten that to EDK. I have carried one of these on a small belt sheath on my side every day for all of my adult life. I can’t even tell you when I started carrying it, but I’m sure that it is in excess of 30 years. Reaching for it is pure muscle memory at this point. This 74mm size (2.9 inches) is not a common SAK size. It’s in between the keychain size (58mm), and the standard pocket knife size (91mm). As an office worker, I am very comfortable carrying this on a daily basis. The Executive has a large pen knife blade and a small one. It’s got a nail file and scissors. The most unusual implement on it is the orange peeler. There is a small flat head screwdriver on the tip of the orange peeler blade. The orange peeler is exclusive to the Executive. In that 30-plus years of carry, I’ve only lost my knife once. After a week spent without it, I got antsy and placed an order for a replacement. All was right with the world when I once again had the Executive on my hip. I very rarely use the orange peeler for its intended purpose. I have used the little screwdriver on the end a lot. It works great for loosening or tightening the little screws on computer cable connectors. The pointed tip on the end of the nail file works to tighten and loosen small Phillips screws. The large blade is used to open boxes by cutting the tape. The little blade, the scissors, and the nail file keep my nails pretty . I’ve also used the pointed ends of the file and the orange peeler to pry recalcitrant rounds out of the chambers of various firearms. This size class of SAK is what first pops into your head when you think of the Swiss Army knife. The closed length of these SAKs ranges from 84mm to 93mm. this size encompasses the greatest number of models. I have four to share with you, that take us from basic to moderately full featured. Let’s start with the Recruit. The Recruit is a compact 84mm model with large and small knife blades. It also has a bottle cap lifter with large screwdriver, and the can opener blade with the small screwdriver. Like most Swiss Army knives, it also includes tweezers and toothpick in the handle scales. Next up is the new knife that I bought just because I was writing this story, and I had not bought a new Swiss Army knife in a while. This one is the Evolution S111. Notice that this one is not named after some kind of a person. That’s because this one was not originally a Victorinox. This is one those knives from the Delémont Collection, a former Wenger knife. This is my first Wenger. By comparison with the Recruit, you can see that it is basically an expansion of that knife with the addition of two back layer tools, a Phillips screwdriver and an awl. The standard Wenger knife size is 85mm, which is a bit smaller than the standard Victorinox at 91mm. 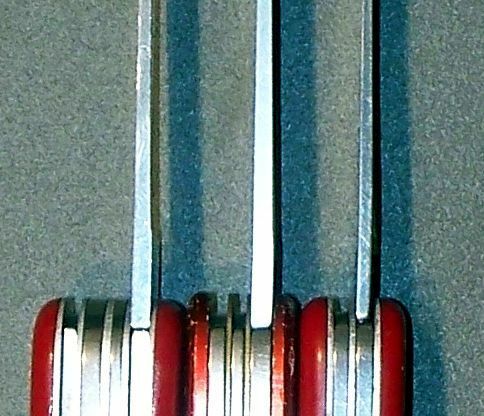 The 91mm Victorinox Tinker has the equivalent tool set as the S111. Because this is a Wenger, there are a couple of interesting differences in this knife if you are used to Victorinox knives. The first major difference is something that Sam mentioned: the large blade locks in the open position. I’ve never seen a locking blade on any Victorinox in this size class, but as I said, I’m not an expert. It’s hard to see in the photo, but the blade locking lever sits in the shadow of the can opener blade. You push it down to unlock the blade. Then there is a half-closed position that catches the blade, allowing you to get your fingers out of the way before you push the blade all the way down to close it. That’s a nice safety feature. Exclusive to the Wengers is the small clip point blade. Compare that to the standard Victorinox small blade on the Recruit on which the back of the point is rounded. The Evo S111 also features Wenger’s ergonomic handle scales. This may also be difficult to see in the photo, but the scales are contoured. There is a nice little dish-out near the base of the large blade which gives a nice place for your thumb to rest. The dish-out on the opposite side feels good to your index finger when holding the knife in a pinch grip. 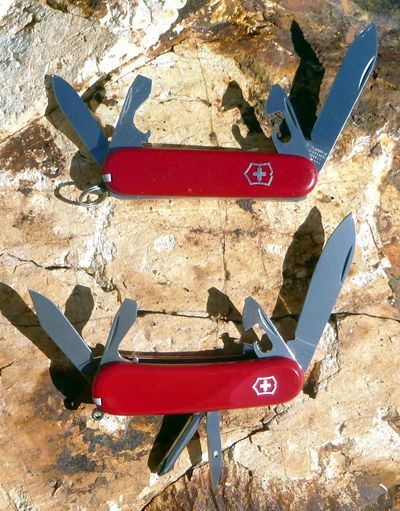 While Victorinox stayed with the Wenger caplifter/large screwdriver blade, they replaced the Wenger can opener blade with the standard Victorinox version. Next I’d like to talk about the Farmer. Right off the bat, you can see what’s different about this one. Instead of smooth plastic scales, it has waffle pattern aluminum scales. Victorinox refers to these scales as Alox, which I presume means aluminum oxide. The Farmer is a commercial derivative of the 1961 pattern Soldier knife. The direct commercial relative of the Soldier knife is the Pioneer model. The Farmer differs from the Pioneer and the Soldier’s knife by the addition of the saw blade. SAK geeks might recognize that this one is a little special. It’s an early, original Farmer. First it has red Alox scales. Second it does not have the typical Victorinox shield. Instead it has a simple Swiss cross. Third, the layer spacers are not aluminum, rather they are brass. Current standard production Farmers have silver Alox handles, aluminum spacers, and exhibit the Victorinox shield. I bought it new, many years ago. I don’t remember when or where, but I do remember seeing it and deciding right away that it had to come home with me. The metal handles just made it look so much cooler than the typical SAK. But here’s a funny thing. For a long time I didn’t even realize that it had a saw! The saw sits right in the middle of the knife and I thought that it was just a divider. But one day I was rolling it around in my hand and I put a fingernail under the tip of the “divider.” It lifted up to reveal a blade that I didn’t even know I had. It was a wonderful surprise. The toolset is particularly well suited for outdoor pursuits. You only need one good cutting blade. The Farmer’s is a bit thicker than the normal SAK blade. Screwdrivers, bottle lifter and can opener are common, but it also has the saw and an awl with a sharpened right angle folded side edge which makes it a great improvised drill. Notice that the Farmer does NOT include the tweezers and toothpick. That is common to all Alox handled SAKs. For a long time, the Farmer always accompanied me in my outdoor pursuits. I’ve used the saw a number of times to clear shooting lanes and to saw through the pelvic bones of downed game. The saw exhibits the scratch marks of honest use. Silver is showing through in a few places on the aluminum scales. Now it’s sort of unofficially retired from the woods. It remains a treasured favorite though. The final medium sized SAK that I have to talk about is the Fisherman. This one came to me because it used to be my Dad’s. When he passed, his knife passed to me. He was pretty big on fishing. I don’t fish much these days, but when I do, this knife comes with me to bring his presence. A number of years ago, I was fishing on the shore at Big Lake in the White Mountains. I had pulled it out of my tackle box to trim some line using the scissors. It came time to try another spot. After about 20 to 30 minutes at the new spot, I realized that the knife was not in my tackle box. There was only one place it could be. I must have left it on the ground where I last used it! So I rushed over there to try to find it. I found somebody else there at my former spot. After looking around for a minute, I asked the guy whether he had seen a Swiss Army knife around here. The look on his face told me. He slowly and reluctantly reached into his pocket and stretched out his palm with the knife in it. Thanks! Whew! The Fisherman builds further on the Recruit and the S111 or Tinker, by adding a hook disgorger/scaler/ruler tool, and a nice pair of scissors. Yes, I have used the hook disgorger for that purpose. You pull on the line to tighten the hook against the tool, then you push and twist to free the hook. It’s not a huge knife, but by the time you get up to this number of devices, you need four layers. The length of the Fisherman is 91mm. The Fisherman, and the related Angler can be identified by the little squirming fish inlaid on the front scale. I have two 111mm Victorinox SAKs. Well, actually three, but I’ll get to that in a minute. All 111mm SAKs feature locking blades. These are the latest design, and in my opinion, are a nice improvement over the classic knives. 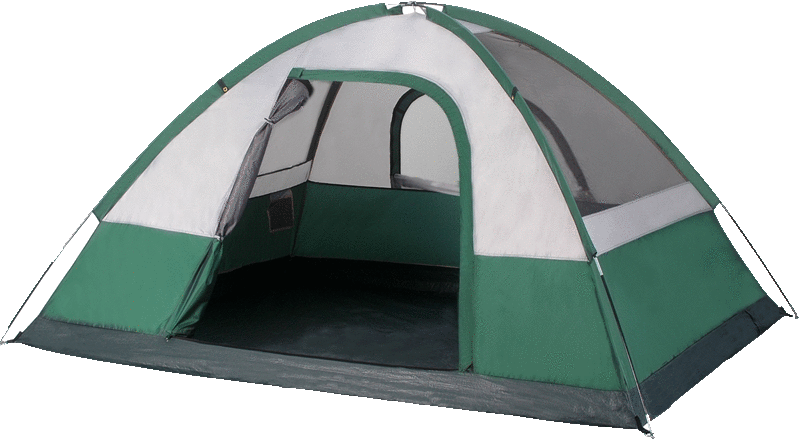 My first one of these was the single-bladed Alpineer. This was another one of those knives that I didn’t seek out, it sought me out. It was a promotional knife that was included when I purchased a Simmons rifle scope back in the 1990s. The word Simmons and the round Simmons logo were silk screened on the back, but this has long ago rubbed off. I almost threw this one away. When I received the scope, I took it out of its shipping box and promptly tossed the packing into the recycling trash. Later I was reviewing the invoice and noticed that there was a line there for the free promotional Swiss Army knife. I headed outside to the trash can and lo and behold, there buried in the packing paper was the knife! Score! The standard Alpineer comes with red scales. Only this promotional version came with black scales. The Alpineer features a grey slide lock button. It’s a little stiff to operate, but it locks very well. The standard Alpineer exhibits the Victorinox shield on the side opposite the locking button. On mine, the shield is on the button side. This one is a favorite home office desk drawer knife, not an outdoor knife for me. Somehow, this is my only SAK with a corkscrew, as common as that silly thing is. Just like what happened when I first laid eyes on the Farmer, the same thing happened when I saw the One-Handed Trekker (or OHT) under a glass counter at a sporting goods store. I had to take it home. And that is the reason that the Farmer has gone into retirement. The OHT is now my go-to multi-purpose tool for outdoor pursuits. And like the Farmer is a derivative of the 1961 Soldier’s knife, the OHT is derived from the new (in 2003) 111mm German Army Knife. The OHT was introduced in that year as a civilian version of the GAK. In 2008, this design was also selected as the new Swiss Soldier’s knife, replacing the Alox handled 1961 Soldier’s knife. The only difference in the civilian version to the military versions is the addition of the tweezers and toothpick, and the black instead of olive drab scales. The toolset is exactly the same. If you compare the features of the OHT to the Farmer, you will see that the OHT is everything that the Farmer is and more. The OHT has a saw and a bigger main blade that is serrated. The main blade locks (liner lock, not a slide lock), and so does the large screwdriver/caplifter. Plus the OHT adds a Phillips screwdriver. The blade on the OHT has a large hole that allows the blade to be opened one-handed, hence the name. The blade cannot be snapped open with one hand. There’s a fair amount of side plate tension and you have to reposition your hand to get it fully open, but the movement is smooth due to the polished surfaces. Oh yeah, I mentioned that I own three 111mm SAKs. I once misplaced my OHT. After several months of nowhere-to-be-found, I placed an order for a new one. When the next hunting season rolled around, I found my lost OHT at the bottom of a hunting equipment box. So now I have two. By the way, that awesome-sharp serrated blade makes a great tomato and onion slicer for camp burgers, not to mention a good mayonnaise spreader. I started off by saying that I am not any kind of a Swiss Army Knife expert. I know that I’ve put a lot of info into this story that makes me sound like one. It was the research that it took to write this article which has made me smarter than I was before I started. Most of that research was on the excellent website SAKWiki.com. 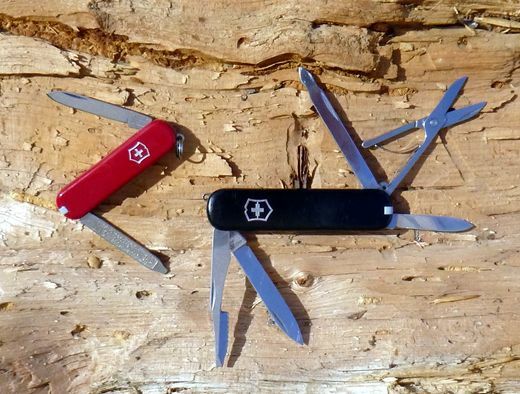 If you want to know even more about Swiss Army knives, go there and dig around.